The photograph you see is courtesy of my 11 year old grandson, Sammy, who lives in northern Virginia, about 20 miles from Washington, DC. 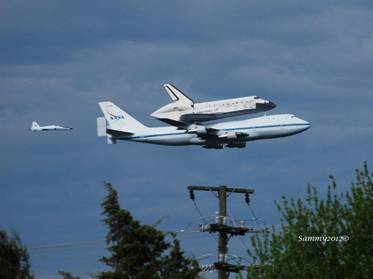 I had started to write about the awarding of the space shuttles last April, but other news prevented me from doing so. The fact that Houston was not on the receiving end had made many Texans angry and very disappointed that politics had played a part in the distribution of the coveted orbiters. But because Obama hates Texas, and all we stand for, it only seemed natural for us not to be ‘awarded’ with one of the retired orbiters. NASA Chief Charles Bolden nominated by none other than Obama, and confirmed by the Senate, made the announcement last year in April as to where each retired orbiter would go. The ‘Discovery’ went to the Smithsonian’s National Air and Space Museum in DC. The Kennedy Space Center in Florida will receive ‘Atlantis’, the California Science Center in Los Angeles will get ‘Endeavour’ and the Intrepid Sea, Air and Space Museum in New York City receives ‘Enterprise’ which will be transferred from the Smithsonian. Just because Texas has NASA – Johnson Space Center in the Bay Area just south of Houston where the space shuttle program has been managed since its inception and all the Astronauts train and live in the area was not sufficient reason to receive a space shuttle…Right? WRONG! When Sammy sent me this photograph on Tuesday, I was reminded of how politics play a huge role in this self absorbed Obama Administration. I am grateful that Sammy sent me this photographic reminder because it opened a sore that will not heal any time soon. As you can see there are consequences to elections. In Obama’s case, not only is he the worst president ever, but his nominations of zombies that do his biding is sickening. As a Texan, as an American, we can not allow this Obama to be reelected. Texas got the Space Center because the president was a Texan who wanted to help out his home state, to the outcry of every other city who felt the process was unfair. At least with the shuttle, every part of the country now has a piece of the shuttle program, not just monopolized by Houston. Texas was chosen as the home to the Manned Spacecraft Center, later renamed the Lyndon B. Johnson Space Center, under President John F. Kennedy and NASA Administrator James E. Webb, neither of which are from Texas. While you are checking your facts, you should take a look at a map. Placing three space shuttles on the east coast and one on the west coast does not evenly distribute them.